Controlling an overly excited dog is about not letting your dog reach the “Hyper Level” in the first place. During the “Bonding Process” you probably noticed that your dog is prone to becoming over stimulated or over excited. This kind of personality requires more patience and understanding than some other personality types. Because of this you need to use a more quiet and low-key approach around your dog. There is nothing “wrong” with your dog. This is simply a personality trait that requires a different method of training. Excitable dogs become even more excited if you use a high-pitched or excited voice. It is very important that you handle your energetic or over excited dog with calm, firm leadership. Also, speak to him in only a calm, firm-toned voice. This helps to keep your dog in a more calm state of mind. It is easier controlling an overly excited dog at level 2 than it is if you wait until it reaches level 10. A good example of this is when you are getting ready to go on a walk. Before you even attach the leash be sure you make the dog sit calmly by the door. Make sure he remains still and quietly while you attach the leash. If you have to battle to attach a leash, it is only going to get worse once the walk starts. To calm him if he becomes excited, ask him to sit or lay down using a low, firm voice. When he does it, quietly praise him or give him a treat. If he doesn’t sit or lay down at first, don’t take it personally. You can place him into a sit by gently pulling up on his collar or leash while putting light pressure on his bottom just in front of his tail. Hold him in place quietly. Do not make any unnecessary noise or movements. After he quits moving around and remains calm, you may or may not want to calmly praise him. Some dogs become excited again so you may want to skip it. But if that happens you will just need to start over again. Avoid using physical contact as much as possible. It may excite him more. Continue to use this process during each step of the walk. Stop and reset the dog each time it becomes overexcited. Remember that outside stimulations like people, animals and other items can trigger excitement. Try to avoid as many of these things as possible until you have reduced your dog’s urge to get overexcited. Physical and mental stimulation is also a great help in controlling an over excited dog. 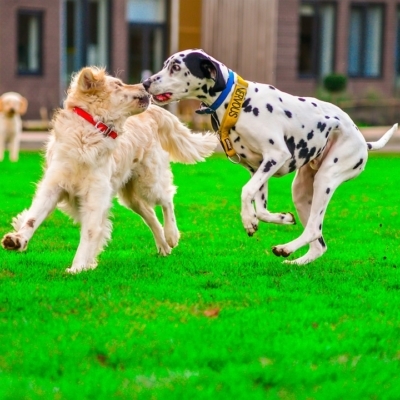 Your dog will burn off a lot of energy playing fetch or other games. Walking or running with your dog is another great way. Another effective outlet for the overly energetic dog is obedience training. Obedience training teaches your dog to sit quietly and also requires him to concentrate. This uses up brain power and physical energy. Obedience training also gives you access to control his activity in the house, in the yard and in public. Teaching a “settle” command is a very effective way to also control excitement inside the home. When the dog becomes overly excited you can place him in a “settle”. The “settle” time should be long enough for the dog to completely relax. This is kind of like putting a child in a “time out”. Five to ten minutes will usually be enough. Your dog will usually be much calmer when the “settle” time has passed. If every time the dog gets overly excited you demand it to “settle”, he will learn that he is to be calm when he is inside the house. Extremely energetic or nervous dog should be given appropriate outlets to release the pent up energy. You will be sorry if you don’t. High energy and nervous dog’s often resort in chewing to release energy. If your sofa happens to get in the way, you may be looking for a new one sooner than expected. It is important to evaluate your dog’s energy level from time to time. This will allow you to adjust its lifestyle and exercise schedule accordingly. The first recommendation pet owners often receives is to install a fence in their backyard. This usually is NOT enough. Overly energetic dogs need to take long walks or run in order to burn off energy. A large yard is useless if the dog does not use it to run. A better use may be to set up an agility course. Structured activities will burn more energy. There are several variations of this training that will get the same results. If you need help controlling an overly excited dog you can contact us and we can give personal instruction. Contact Us.